The Arabic alphabet ( ) is the script used for writing several languages of Asia and Africa, such as Arabic and Urdu. After the Latin alphabet, it is the second-most widely used alphabet around the world. The alphabet was first used to write texts in Arabic, most notably the , the holy book of Islam. With the spread of Islam, it came to be used to write many languages of many language families including, at various times, Urdu, Pashto, Baloch, Malay, Fulfulde-Pular, Hausa, Mandinka (in West Africa), Swahili (in East Africa), Balti, Brahui, Panjabi (in Pakistan ), Kashmiri, Sindhi (in India and Pakistan), Arwi (in Sri Lanka ), Chinese, Uyghur (in China ), Kazakh (in Central Asia), Uzbek (in Central Asia), Kyrgyz (in Central Asia), Azerbaijani (in Iran ), Kurdish (in Iraq and Iran), Ottoman Turkish and Spanish (in Western Europe). In order to accommodate the needs of these other languages, new letters and other symbols were added to the original alphabet. This process is known as the Ajami transcription system, which is different from the original Arabic alphabet. The Arabic script is written from right to left, in a cursive style, and includes 28 basic letters. Because some of the vowels are indicated with optional symbols, it can be classified as an abjad. Just as different handwriting styles and typefaces exist in the Roman alphabet, the Arabic script has a number of different styles of calligraphy, including Naskh خط النسخ, Nastaʿlīq, Shahmukhi, Ruq'ah خط الرقعة, Thuluth خط الثُلث, Kufic الخط الكوفي, Sini and Hijazi. There are two collating orders for the Arabic alphabet. The original abjadī order ( ), used for numbering, derives from the order of the Phoenician alphabet, and is therefore similar to the order of other Phoenician-derived alphabets, such as the Hebrew alphabet. The order ( ), used where lists of names and words are sorted, as in phonebooks, classroom lists, and dictionaries, groups letters by similarity of shape. In addition to the alphaba'i order shown in the table below there is another alphba'i order that was used widely in the Maghreb until recently when it was replaced by the mashriqi order. The abjad order of Mashriq and Maghrib is also different. The Arabic alphabet has 28 basic letters. Adaptations of the Arabic script for other languages, such as Persian, Ottoman, Urdu or Malay, have additional letters, on which see below. There are no distinct upper and lower case letter forms. Many letters look similar but are distinguished from one another by dots above or below their central part, called iʿjam. These dots are an integral part of a letter, since they distinguish between letters that represent different sounds. For example, the Arabic letters transliterated as b and t have the same basic shape, but b has one dot below, , and t has two dots above, . Both printed and written Arabic are cursive, with most of the letters within a word directly connected to the adjacent letters. Unlike cursive writing based on the Latin alphabet, the standard Arabic style is to have a substantially different shape depending on whether it will be connecting with a preceding and/or a succeeding letter, thus all primary letters have conditional forms for their glyphs, depending on whether they are at the beginning, middle or end of a word, so they may exhibit four distinct forms (initial, medial, final or isolated). However, six letters have only isolated or final form, and so force the following letter (if any) to take an initial or isolated form, as if there were a word break. Some letters look almost the same in all four forms, while others show considerable variation. Generally, the initial and middle forms look similar except that in some letters the middle form starts with a short horizontal line on the right to ensure that it will connect with its preceding letter. The final and isolated forms, are also similar in appearance but the final form will also have a horizontal stroke on the right and, for some letters, a loop or longer line on the left with which to finish the word with a subtle ornamental flourish. In addition, some letter combinations are written as ligatures (special shapes), including . For compatibility with previous standards, all these forms can be encoded separately in Unicode; however, they can also be inferred from their joining context, using the same encoding. The following table shows this common encoding, in addition to the compatibility encodings for their normally contextual forms (Arabic texts should be encoded today using only the common encoding, but the rendering must then infer the joining types to determine the correct glyph forms, with or without ligation). The transliteration given is the widespread DIN 31635 standard, with some common alternatives. See the article Romanization of Arabic for details and various other transliteration schemes. Regarding pronunciation, the phonetic values given are those of the pronunciation of literary Arabic, the standard which is taught in universities. In practice, pronunciation may vary considerably between the different varieties of Arabic. For more details concerning the pronunciation of Arabic, consult the article Arabic phonology. The names of the Arabic letters can be thought of as abstractions of an older version where they were meaningful words in the Proto-Semitic language. Six letters are not connected to the letter following them, therefore their initial form matches the isolated and their medial form matches the final. These letters are (أ,د,ذ,ر,ز,و). In addition to the alphaba'i order shown in the table above there is another alphba'i order that was used widely in the Maghrib until recently when it was replaced by the Mashriqi order. The Maghribi order isأ ب ت ث ج ح خ د ذ ر ز س ش ص ض ط ظ ع غ ف ق ك ل م ن هـ و ي from right to left. The abjad order of Mashriq and Maghrib is also different (See Abjad numerals). The letter originated in the Phoenician alphabet as a consonant-sign indicating the glottal stop . Today it has lost its function as a consonant, and, together with and , is a mater lectionis, a consonant sign standing in for a long vowel (see below), or as support for certain diacritics (madda and hamza). with a carrier: (above and under a ), (above a ), (above a dotless or ). Letters lacking an initial or medial version are never connected to the following letter, even within a word. As to the hamza, it has only a single form, since it is never connected to a preceding or following letter. However, it is sometimes combined with a , , or , and in that case the carrier behaves like an ordinary , , or . In academic work, the glottal stop is transliterated with the right half ring sign ( ), while the left half ring sign ( ) represents a different pharyngeal, pharyngealized glottal, or epiglottal sound. The only compulsory ligature is + . All other ligatures ( + , etc.) are optional. The shadda sign indicates a doubled consonant. Gemination is the doubling of a consonant. Instead of writing the letter twice, as in English, Arabic places a w-shaped sign called , or shadda, above it. (The generic term for such diacritical signs is harakat). When a shadda is used on a consonant which also takes a (a dash below the consonant indicating that it takes a short /i/ as its vowel), the kasra may be written between the consonant and the rather than in its normal place. ـٌ /-un/, ـٍ /-in/ and ـً /-an/ Nunation (the Arabic term is تنوين, tanwīn) is the addition of a final /-n/ to a noun or adjective to indicate grammatical case. In written Arabic it is indicated by doubling the vowel diacritic at the end of the word. There are three of these vowel diacritics, and the signs indicate, from left to right, the endings /-un/ (nominative case), /-an/ (accusative), and /-in/ (genitive). The sign is most commonly written in combination with ‎( ), ( تاء مربوطة ) or stand-alone hamza همزة. Alif should always be written (except for words ending in tāʼ marbūṭa, hamza or diptotes), even if "un" is not. Nunation is used only in formal Arabic (including Modern Standard Arabic); it is absent in everyday spoken Arabic, and many Arabic textbooks introduce even standard Arabic without these endings. The Arabic alphabet is an "impure" abjad. Long vowels are written, but short ones are not, so the reader must be familiar with the language to understand the missing vowels. However, in editions of the and in didactic works, vocalization marks are used, including the sukūn for vowel omission and the šadda for consonant gemination (consonant doubling). In the Arabic handwriting of everyday use, in general publications, and on street signs, short vowels are typically not written. On the other hand, prints of the cannot be endorsed by the religious institutes that review them, unless short vowels are properly marked. It is also generally preferred and customary that they be included whenever the is cited in print. Children's books, elementary-school texts, and Arabic-language grammars in general will include diacritics to some degree. These are known as "vocalized" texts. Written Arabic cannot be considered truly complete without the notation of its short vowels, which are essential to it. They convey information not coded in any other way. Like dotted letters, diacritical marks were a later addition to the writing system. Short vowels can be included in cases where word ambiguity could not easily be resolved from context alone, or simply wherever they might be considered aesthetically pleasing. Short vowels may be written with diacritics placed above or below the consonant that precedes them in the syllable, called harakat. All Arabic vowels, long and short, follow a consonant; in Arabic, words like "Ali" or "alif", for example, start with a consonant: , . A long a following a consonant other than a hamza is written with a short a sign on the consonant plus an after it; long i is written as a sign for short i plus a ; and long u as a sign for short u plus a . Briefly, aʾ = ā, iy = ī and uw = ū. Long a following a hamza may be represented by an or by a free hamza followed by an ʾalif. In the table below, vowels will be placed above or below a dotted circle replacing a primary consonant letter or a šadda sign. For clarity in the table below, the primary letter on the left used to mark these long vowels are shown only in their isolated form. Please note that most consonants do connect to the left with , and written then with their medial or final form. Additionally, the letter in the last row may connect to the letter on its left, and then will use a medial or initial form. Use the table of primary letters to look at their actual glyph and joining types. In unvocalized text (one in which the short vowels are not marked), the long vowels are represented by the vowel in question: , (or ), , or . Long vowels written in the middle of a word of unvocalised text are treated like consonants with a sukūn (see below) in a text that has full diacritics. Here also, the table shows long vowel letters only in isolated form for clarity. Combinations وا and يا are always pronounced and respectively, the exception is when وا is the verb ending, where ʾalif is silent, resulting in . An Arabic syllable can be open (ending with a vowel) or closed (ending with a consonant). When the syllable is closed, we can indicate that the consonant that closes it does not carry a vowel by marking it with a diacritic called ( ) to remove any ambiguity, especially when the text is not vocalized. A normal text is composed only of series of consonants; thus, the word , "heart", is written . The indicates where not to place a vowel: could, in effect, be read qalab (meaning "he turned around"), but written with a sukūn over the and the ( ), it can only have the form qVlb. This is one step down from full vocalization, where the vowel a would also be indicated by a : . The is traditionally written in full vocalization. Outside of the , putting a above a (representing ), or above a (representing ) is extremely rare, to the point that with sukūn will be unambiguously read as the diphthong , and with will be read . For example, the letters ( with an at the end of the word)will be read most naturally as the word ("music"). If one were to write a above the , the and the , one would get , which would be read as (note however that the final , because it is an , never takes a ). The word, entirely vocalized, would be written as . The Quranic spelling would have no sign above the final , but instead a miniature above the preceding consonant, which is a valid Unicode character but most Arabic computer fonts cannot in fact display this miniature as of 2006. No is placed on word-final consonants, even if no vowel is pronounced, because fully vocalised texts are always written as if the vowels were in fact pronounced. For example, , meaning “Ahmed is a bad husband”, for the purposes of Arabic grammar and orthography, is treated as if still pronounced with full , i.e. with the complete desinences. The is also used for transliterating words into the Arabic script. The Persian word (mâsk, from the English word "mask"), for example, might be written with a sukūn above the to signify that there is no vowel sound between that letter and the . ڤ - Vā', sometimes used to represent the letter V when transliterating foreign words in Arabic. Also used in writing dialects with that sound. Normally the letter ف - Fā' is used to transliterate the V letter. Also used as Pa in the Jawi script. In Tunisia a character similar to Vā' in its initial and medial forms, is sometimes used to represent the phoneme . In final and isolate form it has the form ڨ which resembles the letter Qāf whence it is derived. The sound V in Tunisia is rendered using the Arabic letter Fa with three dots underneath ڥ. پ - Pā', used to represent the sound in Persian, Urdu, and Kurdish; sometimes used to represent the letter P when transliterating foreign words in Arabic, although Arabic nearly always substitutes B for P in the transliteration of foreign terms. Normally the letter ب - Bā' is used to transliterate the P letter. So, "7up" can be transcribed as سفن أب or سڤن أﭖ. Also used in Persian, and Urdu. چ - Chā', used to represent the ("ch") phoneme. It is used in Persian, Urdu, and Kurdish and sometimes used when transliterating foreign words in Arabic, although Arabic usually substitutes other letters (such as t + sh, as in Chad ) in the transliteration of foreign terms. Normally the combination تش - tā' and šīn are used to transliterate the ("ch") sound. Ca in the Jawi script. گ - Gāf, used to represent the phoneme (as in "get"). Normally used in Persian, Kurdish, and Urdu. Often foreign words with the G sound are transliterated in Arabic with ك (kāf), غ (ġayn) or ج ( ), which may or may not change the original sound, (in Egyptian Arabic ج is usually read as a hard "G" (get), which also creates a confusion when the original sound is like the English (j) phoneme (as in "job")). Also used in Persian, Urdu, and Bedouin dialects. ژ - Zhe, used to represent a voiced postalveolar fricative in, Persian, Kurdish, Urdu and Uyghur. This is used to transliterate words of foreign origin, mostly French, in Levantine and Maghrebi Arabic dialects. Also, very seldom in Arabic to render sound, and normally, the letter shin is used to transliterate . ژ - Zhe, represents a voiced postalveolar fricative in Persian, Urdu, Kurdish, and Uyghur. Also, very seldom in Arabic to render /ʒ/ sound. ݣ - Gaf, represents G in informal Moroccan Arabic, as well as officially to transliterate the letter G in many city names such as Agadir (أݣادير), and family names such as El Guerrouj (الݣروج). There are two kinds of numerals used in Arabic writing; standard numerals (predominant in the Arab World), and Eastern Arabic numerals (used in Iran , Afghanistan , Pakistan and India ). In Arabic, the former are referred to as "Indian numbers" ( , ). Arabic (or Hindu-Arabic) numerals are also used in Europe and the rest of the Western World in a third variant, the Western Arabic numerals, even though the Arabic alphabet is not. In most of present-day North Africa, the usual western numerals are used; in medieval times, a slightly different set was used, from which Western Arabic numerals derive, via Italy. Like Arabic alphabetic characters, Arabic numerals are written from right to left, though the units are always right-most, and the highest value left-most, just as with Western "Arabic numerals". Telephone numbers are read from left to right. In addition, the Arabic alphabet can be used to represent numbers (Abjad numerals). This usage is based on the abjadī of the alphabet. is 1, is 2, is 3, and so on until = 10, = 20, = 30, …, = 200, …, = 1000. This is sometimes used to produce chronograms. Later still, vowel marks and the hamza were introduced, beginning some time in the latter half of the seventh century, preceding the first invention of Syriac and Hebrew vocalization. Initially, this was done by a system of red dots, said to have been commissioned by an Umayyad governor of Iraq , Hajjaj ibn Yusuf: a dot above = , a dot below = ,a dot on the line = , and doubled dots indicated nunation. However, this was cumbersome and easily confusable with the letter-distinguishing dots, so about 100 years later, the modern system was adopted. The system was finalized around 786 by al-Farahidi. Although Napoleon Bonaparte generally is given the credit with introducing the printing press to Egypt , upon invading it in 1798, and he did indeed bring printing presses and Arabic script presses, to print the French occupation's official newspaper Al-Tanbiyyah (The Courier), the process was started several centuries earlier. Gutenberg's invention of the printing press in 1450 was followed up by Gregorio de Gregorii, a Venetian, who in 1514 published an entire prayer book in Arabic script entitled Kitab Salat al-Sawa'i intended for the eastern Christian communities. The script was said to be crude and almost unreadable. Famed type designer Robert Granjon working for Cardinal Ferdinando de Medici succeeded in designing elegant Arabic typefaces and the Medici press published many Christian prayer and scholarly Arabic texts in the late sixteenth century. The first Arabic books published using movable type in the Middle East were by the Maronite monks at the Maar Quzhayy Monastery in Mount Lebanon . They transliterated the Arabic language using Syriac script. It took a fellow goldsmith like Gutenberg to design and implement the first true Arabic script movable type printing press in the Middle East. The Greek Orthodox monk Abd Allah Zakhir set up an Arabic language printing press using movable type at the monastery of Saint John at the town of Dhour El Shuwayr in Mount Lebanon, the first homemade press in Lebanon using true Arabic script. He personally cut the type molds and did the founding of the elegant typeface. He created the first true Arabic script type in the Middle East. The first book off the press was in 1734; this press continued to be used until 1899. → Countries where the Arabic script is used officially alongside other orthographies. The Arabic script has been adopted for use in a wide variety of languages besides Arabic, including Persian, Kurdish, Malay, and Urdu, which are not Semitic. Such adaptations may feature altered or new characters to represent phonemes that do not appear in Arabic phonology. For example, the Arabic language lacks a voiceless bilabial plosive (the sound), so many languages add their own letter to represent in the script, though the specific letter used varies from language to language. These modifications tend to fall into groups: all the Indian and Turkic languages written in Arabic script tend to use the Persian modified letters, whereas Indonesian language tend to imitate those of Jawi. The modified version of the Arabic script originally devised for use with Persian is known as the Perso-Arabic script by scholars. In the case of Kurdish, vowels are mandatory, making the script an abugida rather than an abjad as it is for most languages. Kashmiri and Uyghur, also, write all vowels. Use of the Arabic script in West African languages, especially in the Sahel, developed with the penetration of Islam. To a certain degree the style and usage tends to follow those of the Maghreb (for instance the position of the dots in the letters fāʼ and qāf). Additional diacritics have come into use to facilitate writing of sounds not represented in the Arabic language. The term Ajami, which comes from the Arabic root for "foreign", has been applied to Arabic-based orthographies of African languages. 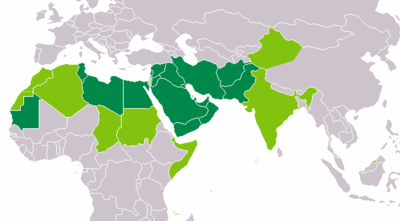 Today Iran , Afghanistan, Pakistan, India, and China are the main non-Arab states using the Arabic alphabet to write one or more official national languages, including Persian, Dari, Punjabi, Pashto, Urdu, Kashmiri, Sindhi, and Uyghur. Garshuni (or Karshuni) originated in the seventh century AD, when Arabic was becoming the dominant spoken language in the Fertile Crescent, but Arabic script was not yet fully developed and widely read. There is evidence that writing Arabic in Garshuni influenced the style of modern Arabic script. After this initial period, Garshuni writing has continued to the present day among some Syriac Christian communities in the Arabic-speaking regions of the Levant and Mesopotamia. Kyrgyz by its 150,000 speakers in the Xinjiang Uyghur Autonomous Region in northwestern China . The Chinese language is written by some Hui in the Arabic-derived Xiao'erjing alphabet. The Arwi language (a mixture of Arabic and Tamil) uses the Arabic script together with the addition of 13 letters. It is mainly used in Sri Lanka and the South Indian state of Tamil Nadu for religious purposes. Malayalam language represented by Arabic script variant is known as Arabi Malayalam.The script has particular alphabets to represent the peculiar sounds of Malayalam.This script is mainly used in Madrassas of South Indian state of Kerala and Lakshadweep to teach Malayalam. The Thaana script used to write the Dhivehi language in the Maldives has vowels derived from the vowel diacritics of the Arabic script. Some of the consonants are borrowed from Arabic numerals. Malay in the Arabic script known as Jawi is co-official in Brunei , and used for religious purposes in Malaysia , Indonesia , Southern Thailand, Singapore , and predominantly Muslim areas of the Philippines . Therefore, Arabic script or Jawi can be seen or used for the sign board or market or shop board. Particularly in Brunei, Jawi is practically used in terms of writing or reading for Islamic Religious Educational Program which is like Primary school, Secondary School, College even higher educational institute such as University. In addition, some television programs is associated with Jawi for announcement, advertisement, news, social programs, obviously religious program and etc. Early history of Islamic belief and culture is experienced by Brunei from the influenced of Arabian merchants. Through the Arabian reached Brunei, some culture of Brunei is mixed with Arab even today some language is derived from Arab words. According to history, during the 14th century the founder of Brunei Sultanate is Sultan Muhammad Shah (1363 to 1402, formerly Awang Alak Betatar) who converted to Islam through the relational marriage with Tumasek (now Singapore ) princess (now Johor in which at that time already received the teaches of Islamic faith). However, the influence of Islam is not strong enough at that time in Brunei. During 15th century one of Arab merchant named Sharif Ali, who believed was the direct-descendant of Muhammad, his grandchild, was Saidina Hassan r.a who married Sultan Ahmad's daughter, Puteri Ratna Kesuma. He became the third sultan of Brunei and called as Sultan Sharif Ali (also known as Barkat Ali ibnu Sharif Ajlan ibni Sharif Rumaithah). He was made Sultan after Sultan Ahmad died without leaving any male descendants, and as such, at the request of the people of Brunei themselves, he became eligible for the throne after marrying Sultan Ahmad's daughter, Puteri Ratna Kesuma. His legacy by adding "Darussalam" which mean abode of peace after Brunei. Today, in the Brunei flag there is Jawi scripted in the emblem. Tamazight and other Berber languages were traditionally written in Arabic in the Maghreb. There is now a competing 'revival' of neo-Tifinagh. In the 20th century, the Arabic script was generally replaced by the Latin alphabet in the Balkans, parts of Sub-Saharan Africa, and Southeast Asia,while in the Soviet Union , after a brief period of Latinisation, use of the Cyrillic alphabet was mandated. Turkey changed to the Latin alphabet in 1928 as part of an internal Westernizing revolution. After the collapse of the Soviet Union in 1991, many of the Turkic languages of the ex-USSR attempted to follow Turkey's lead and convert to a Turkish-style Latin alphabet. However, renewed use of the Arabic alphabet has occurred to a limited extent in Tajikistan , whose language's close resemblance to Persian allows direct use of publications from Iran. Most languages of the Iranian languages family continue to use Arabic script, as well as the Indo-Aryan languages of Pakistan and of Muslim populations in India , but the Bengali language of Bangladesh is written in the Bengali alphabet. Harari, by the Harari people of the Harari Region in Ethiopia . Now uses the Ge'ez and Latin alphabets. Romanian in certain areas of Transylvania (until the 17th century a vassal state of the Ottoman Empire) . All the Muslim peoples of the USSR between 1918-1928 (many also earlier), including Bashkir, Chechen, Kazakh, Tajik etc. After 1928 their script became Latin, then later Cyrillic. Malay in Malaysia and Indonesia ; Maguindanaon and Tausug in the Philippines . Kurdish (Kurmanji dialect) in Turkey and Syria was written in Arabic script until 1932, when a modified Kurdish Latin alphabet was introduced by Jaladat Ali Badirkhan in Syria. The Arabic alphabet can be encoded using several character sets, including ISO-8859-6 and Unicode, in the latter thanks to the "Arabic segment", entries U+0600 to U+06FF. However, neither of these sets indicate the form each character should take in context. It is left to the rendering engine to select the proper glyph to display for each character. The basic Arabic range encodes the standard letters and diacritics, but does not encode contextual forms (U+0621–U+0652 being directly based on ISO 8859-6); and also includes the most common diacritics and Arabic-Indic digits. U+06D6 to U+06ED encode Qur'anic annotation signs such as "end of ayah" and "start of rub el hizb" . The Arabic Supplement range encodes letter variants mostly used for writing African (non-Arabic) languages. The Arabic Presentation Forms-A range encodes contextual forms and ligatures of letter variants needed for Persian, Urdu, Sindhi and Central Asian languages. The Arabic Presentation Forms-B range encodes spacing forms of Arabic diacritics, and more contextual letter forms. When one wants to encode a particular written form of a character, there are extra code points provided in Unicode which can be used to express the exact written form desired. The range Arabic presentation forms A (U+FB50 to U+FDFF) contain ligatures while the range Arabic presentation forms B (U+FE70 to U+FEFF) contains the positional variants. These effects are better achieved in Unicode by using the zero width joiner and non-joiner, as these presentation forms are deprecated in Unicode, and should generally only be used within the internals of text-rendering software, when using Unicode as an intermediate form for conversion between character encodings, or for backwards compatibility with implementations that rely on the hard-coding of glyph forms. Finally, the Unicode encoding of Arabic is in logical order, that is, the characters are entered, and stored in computer memory, in the order that they are written and pronounced without worrying about the direction in which they will be displayed on paper or on the screen. Again, it is left to the rendering engine to present the characters in the correct direction, using Unicode's bi-directional text features. In this regard, if the Arabic words on this page are written left to right, it is an indication that the Unicode rendering engine used to display them is out-of-date. There are competing online tools, e.g. Yamli editor, allowing to enter Arabic letters without having Arabic support installed on a PC and without the knowledge of the layout of the Arabic keyboard. The first software program of its kind in the world that identifies Arabic handwriting in real time has been developed by researchers at Ben-Gurion University . Tajik Language: Farsi or Not Farsi? by Sukhail Siddikzoda, reporter, Tajikistan. See also MULTILINGUAL COMPUTING WITH ARABIC AND ARABIC TRANSLITERATION Arabicizing Windows Applications to Read and Write Arabic & Solutions for the Transliteration Quagmire Faced by Arabic-Script Languages and A PowerPoint Tutorial (with screen shots and an English voice-over) on how to add Arabic to the Windows Operating System. Clavier Arabes — pronunciation of the letters, and instructions to write them. Arabic keyboard to type Arabic characters on computers which do not have a keyboard for typing the Arabic alphabet. Arabic keyboard Arabic keyboard for Search Engine. Yamli Real time transliteration engine.